Last month, Samsung announced the much-awaited Galaxy Tab 10.1 at the Mobile World Congress (MWC) 2011 in Barcelona. This device is the successor of the Samsung’s popular tablet, the Galaxy Tab. After the launch of iPad 2, Samsung was quite shocked with the slimmer design and same pricing of the iPad 2. 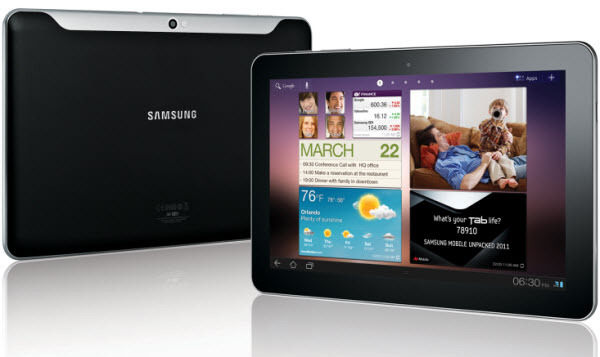 To stay ahead in the competition, Samsung recently unveiled the new redesigned Galaxy Tab 10.1 at the CTIA show. The new Galaxy Tab 10.1 is even thinner than the iPad 2 and it is currently the thinnest tablet available in the market. Check out the complete specs, after the break. Galaxy Tab 10.1 comes with the surround-sound stereo speakers and support for Flash 10.2, which will deliver premium entertainment experience whether watching videos, movies or playing games. This device measures 256.6 mm x 172.9 mm x 8.6 mm and weighs 595g. Galaxy Tab 10.1 will be available from June 8 for just $499 for the 16GB Wi-Fi version and $599 for the 32GB Wi-Fi version.